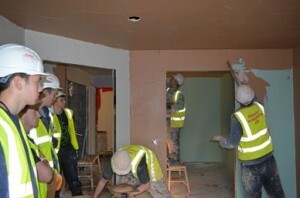 Reaseheath plasterers have been gaining industry tips and experience during their latest site visit thanks to Perkins Plasterers of Stoke-on-Trent. Perkins Plasterers invited students to visit one of their larger projects, an 80 apartment retirement village site. During the visit, students had the opportunity to see a range of skills and attributes plasterers require for success within the modern construction industry. All of our plasterers sat through a thorough site induction, which was excellent, as it helped to bring aspects of their health and safety theory module to life. Due to size of the site, students were able to see apartments at a variety of different construction stages. They were treated to demonstrations of a range of different plastering practices and techniques including floor screeding, metal partitioning, plasterboarding and skimming walls and ceilings. Students also had chance to ask lots of questions, of which they had plenty – in particular for the plasterers of course! We were also fortunate enough to welcome Perkins Plasterers to our recent construction careers event, held on campus. Members of the Perkins’ team kindly joined other industry representatives, former students and the construction team to discuss construction courses and careers with our visitors. For more information on our Construction courses visit the college website. GB are currently on site at Reaseheath College in Cheshire and are working with the College to maximise opportunities for the students. For two consecutive Fridays we arranged for students from Reaseheath to visit our other project in Cheshire, Kings Leadership Academy. The first visit consisted of students studying Level 2 Diploma Bricklaying and the second visit were Level 1 Diploma Carpentry and Joinery. The students were given a overview of the project, shown drawings and then taken out on site for a full tour. The students found it very interesting and provided quotes below. The Hawk Group comprises of plant, tractors, homes, plant sales, developments, cabins, contracts, international, Hawkins Motors and safety and training. With a turnover of more than £75 million and with several of our ex-students working for them on the Homes and Developments side the construction department are keen to forge stronger links. A group of 2nd year Bricklayers visited Hawks open day event at Sandford near Whitchurch. Students were able to operate plant machinery with the aid of an instructor ranging from 360 excavators in a range of sizes to 6 wheel drive 15 ton dumper trucks, off road vehicle’s and machine simulators.